Growing Mint/pudina at home !! Dear Readers, mint is an exotic, excellent aromatic herb; it contains Vitamin A and C and is also rich in a number of minerals. Mint is an exclusive perennial herb which means that it comes back year after year. Mint leaves are a good coolant and worldwide famous for their medicinal values. They are also considered as a good digestive. Mint has an important place in Indian cuisine. Mint leaves are used to make chutneys, drinks, and other coolants. They are also used in parathas, pulavs, raitas etc. I love gardening and mint is an integral part of my kitchen garden. Believe me, it is really easy to grow mint at home. You can start from seeds by sowing the mint seeds in mild weather or you can just plant some. 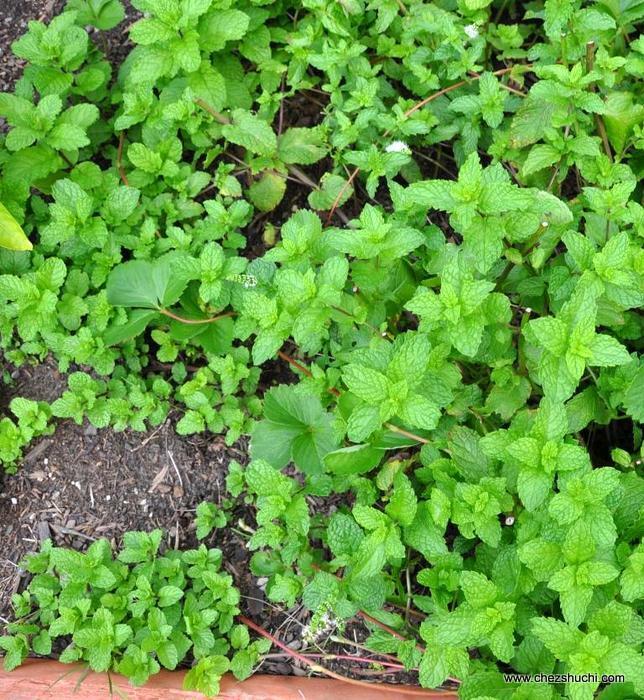 Mint is a perennial so just plant it once and it comes back every year by itself. The mint comes back itself only if you have planted it in the ground. I had plated just one small mint plant in the ground in 2013. 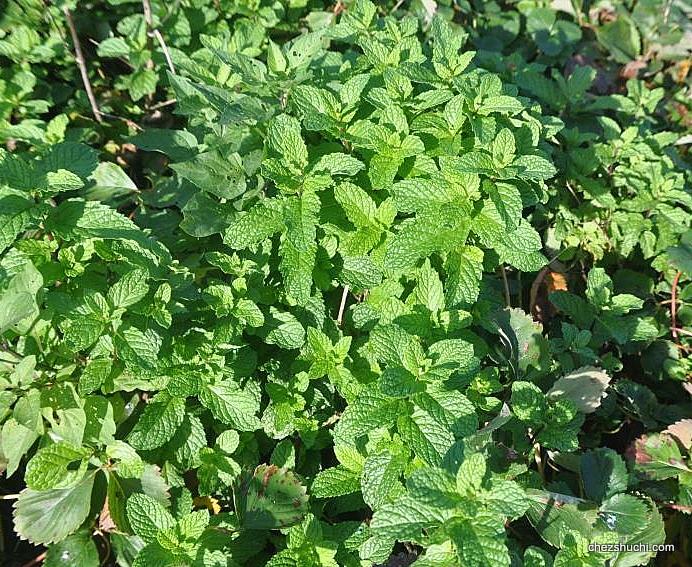 Today there are numerous mint plants in the nearby areas. Every year I donate many mint plants to friends and neighbors but there are still plenty. Basically, what I am trying to say is that mint grows like a weed. It is a fast growing perennial. Every year the existing mint leaves freeze in mid-October (plant goes dormant) when the frost comes, as I live in a colder state of USA (Zone 5). In March, or in the beginning of April, the new mint leaves come in the existing roots. They come in abundance so I donate a lot and yet I still have enough to freeze and make dry mint powder for all the entire winter months. I haven't bought any mint after 2014 since we get enough from our garden. The big leaves and white flowers you ae seeing in the photo below are of strawberries. The mint grows so fast that it has taken over the strawberries. I live in a colder state of USA (Zone 5), so I wait for the snow to go. After the snow is gone, and the weather is mild, plant mint in the container. You can sow the mint seeds or can buy a baby plant. In order to grow mint in container, fill the container with organic soil. Plant a baby mint plant. Sprinkle some water to moisten the soil. Mint likes moistened soil so make sure to water regularly. If you live in a cold country move your mint container indoor, otherwise it will not come back after the snow. You can choose pretty much any size and shape of container. Make sure it has good drainage. Mint leaves are ready to be used in 15-20 days. To harvest mint cut the stem from top and leave 2-3 inches from bottom. The same plant will keep growing. In fact more you cut the mint sprigs the faster it grows. Don't forget to water the mint plant. Mint likes damp soil. Remove the thick stem and wash the mint leaves thoroughly. Leave the mint leaves on the sieve to drain the water. When extra water is drained spread the leaves on a clean towel. Wipe the mint leaves with a clean cloth. Take a ziplock bag. Write down the date and herbs name. Now keep the mint leaves in the ziplock bag. Remove the extra air from the bag and zip lock it. Store it in the freezer. Following pic shows the mint ready to freeze. These leaves can be kept in the freezer for months. Use mint leaves as needed. Mint powder is extensively used in Indian cuisine. Here is a recipe to make mint powder at home. I use fresh mint leaves, frozen leaves, and the dried mint leaves powder a lot in my kitchen. Mint is a coolant and used more in the summer in drinks, chutneys, raitas etc. It can also be used in breads, rice, curries etc. I have gathered all the recipes using mint in this site. Here are some mint recipes to get an idea of how to use mint. This chutney made with Mint(pudina) and raw mango (kachcha aam) is not only delicious but also healthy - Mint is a very good digestive and raw mangoes are a good source of vitamins A & C. This is a very popular accompaniment with many starters. Mattha is also called as chach or butter milk. This is a very healthy, and delicious drink that can be served any time. It is a very good coolant, especially during the summers: it helps to protect against the hot wind of burning summer afternoons. Jgungle fresh is a very soothing drink. This refreshing drink is made with freshly made mint juice, lime juice, orange juice and flavored with salt and sugar. This drink can be served any time of the year. Kids also love this drink .